There was an old married couple and they had always hated each other, never been able to stand each other, really. / And when they were in their nineties, they finally got divorced. / And when people said: why did you wait so long? / Why didn’t you do this a whole lot earlier? / And they said: well, we wanted to wait until the children died. Just another day in America. 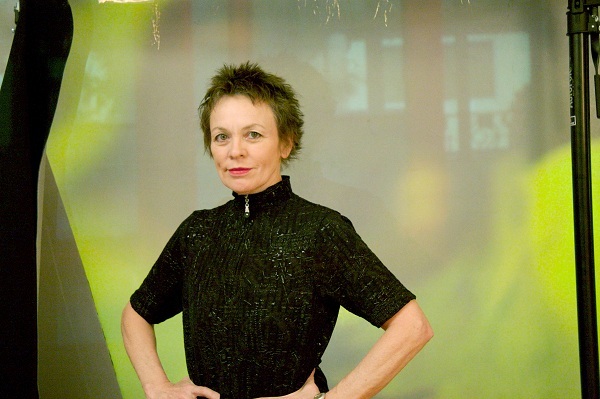 This according to the writer, New York-based artist/musician Laurie Anderson, whose latest performance piece, the aptly titled ‘Another Day in America’ has recently made its debut, in Canada. Event organisers describe a musical symposium replete with dizzying portraits of cities and people, combined with an hallucinatory use of language and electronic soundscapes. This recent addition (to an already outstanding oeuvre) marks a significant shift in Anderson’s predominantly future-focused repertoire, a revelatory journey to the not-too-distant present. 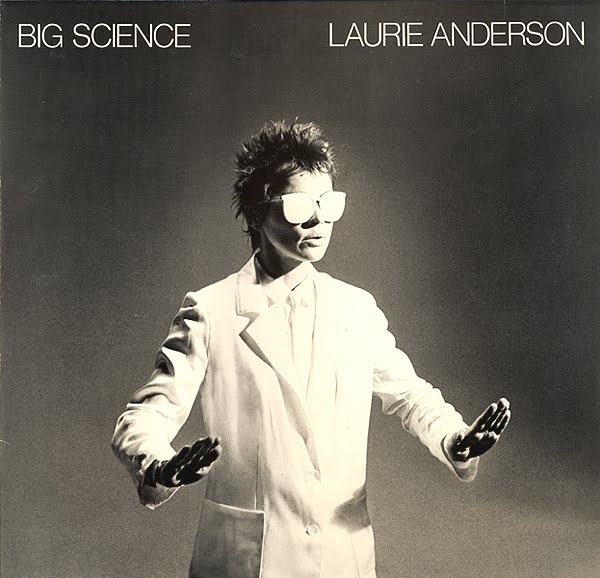 Anybody familiar with Anderson will recognise her early fascination with people, language and sound from her landmark record Big Science (1982), a dissonant blend of screeches and stomps played behind existential, and often nihilistic, poetry (‘From the Air’, ‘Walking and Falling’). The album proved a refreshing contrast to the synth-heavy New Wave-era of early 1980s, offering an innovative mix of instrumentation (bagpipes, saxophone, telephone rings, and vocoder), and an illusionary concept of our ever-changing planet. So compelling was the message, that she scored a #2 hit in the UK with the eight-minute long clarion call ‘O Superman’. Coincidentally, 2012 will also mark the album’s 30th anniversary. Fortunately for the earliest of die-hard fans, her observations of the brave new world are just as pertinent today. Last year’s Homeland, which features contributions by husband Lou Reed and Antony Hegarty, exposes the idiotic tactics employed by problem-solving daytime talk show hosts on ‘Only an Expert’ and delves as deeply into romantic territory as she dare, questioning the dimwitted idea of never-ending love on ‘Strange Perfumes’. The record proves vital to the American landscape, as it did 30 years ago, with Anderson on the receiving end of much critical acclaim, even snagging her third career nomination at last year’s Grammy Awards (best pop instrumental performance for ‘Flow’). Her music defies the limits of classification. Her artistic influences lie somewhere between post-modern and The Jetsons. A time-traveller. An inventor (the tape-bow violin and the six-foot-long MIDI controller-synched talking stick can be credited to her). An electronic pioneer and bona fide sonic architect. Commissioned by the Vancouver 2010 Cultural Olympiad, originally imagined as a sequence of mystery plays, with influences ranging from Balzac to Tristram Shandy, Anderson incorporated puppetry and eerily altered voices to weave a complicated narrative about sense memory and identity, underlying the chilling reality that “the world is comprised entirely of words.” It is also the recital that culminates in Anderson giving birth to her dog, Lolabelle, on stage. Conceived as a result of her invitation to become NASA’s first and, so far, only artist-in-residence, the organization bestowed upon Anderson a $20,000 (US) dividend to produce an original piece of her own imagining. Featuring new musical composition and instrumentation, ‘…Moon’ is the result of many beguiling hours of lab research and stargazing. A pleasantly surprising foray into the realm of pop music, Mister Heartbreak, a whimsical record of bird calls and gentle cooing, featured collaborations with Peter Gabriel, Phoebe Snow and William S. Burroughs, garnering a four-star review from the very mainstream rock ‘n’ roll bible Rolling Stone. Considered Anderson’s magnum opus, and another chart success in the UK, this full-length piece (originally run over the course of two nights, eight hours in total), which relied heavily on visual art, incorporated animated vignettes and spoken dialogue about life in the US. One of her most frequent pieces, which she happily reenacts just about every decade, is her curious concert in which, while strapped into her skates, she will perch on two blocks of ice and play her violin. When the ice has melted completely, the show is over. Simple as that. This month, Anderson has added yet another production to this wall, with the premiere of ‘Another Day in America’, strangely enough, in Calgary, Alberta, Canada. That’s right: an exploratory glance at American life was first transmitted from a sure-to-be frigid Canadian monument: the rodeo. Ever the artist: keep ’em guessing. 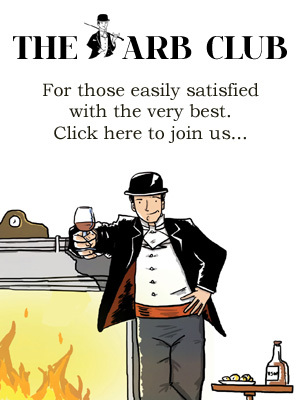 For more information, visit www.laurieanderson.com.